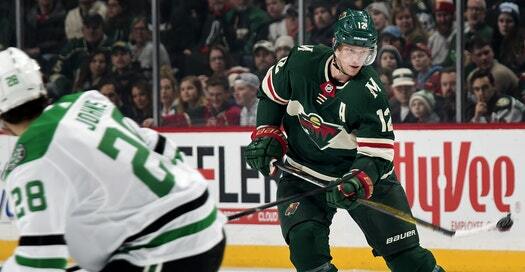 The spotlight on Wild center Eric Staal continues to grow. After being named the first star of the week Monday and turning in a dominant performance Tuesday in which he scored a hat trick and tallied five points, Staal was crowned the NHL’s first star of the month for February Thursday. Staal had 13 goals and eight points in 13 games in February to lead the NHL with 21 points. He posted two five-game point streaks and four multi-point efforts, helping the Wild go 9-2-2 to jump up into the third spot in the Central Division. The 33-year-old also recorded at least a point in 11 of his 13 games. His 33 goals are tied for fourth in the NHL, while his 64 points put him 16th in the NHL scoring race. The Wild’s schedule continues Thursday against the Coyotes, the first game of a back-to-back that wraps up Friday in Colorado against the Avalanche. Backup Alex Stalock will handle the first test, with No.1 Devan Dubnyk slated to take the second game. This begins a stretch of seven games against opponents out of a playoff position, but coach Bruce Boudreau is expecting the Coyotes to pose a challenge – especially since Arizona upended the Wild 4-3 in overtime Feb. 8 in Minnesota. 26: Points for Staal and wingers Jason Zucker and Mikael Granlund the last three games. 5: Game point streak for Staal, who has 12 points in that span. 4: Consecutive road wins for the Wild. 3: Goals for Coyotes winger Brendan Perlini in four career games against the Wild. 9: Points for Arizona center Derek Stepan in his last 10 games. Arizona has been better lately, going 6-2-1 in its last nine games. The team is in the midst of a seven-game homestand, sitting 3-2 so far. Overall, the team is 10-18-4 on home ice. Rookie Clayton Keller leads the team in goals (17) and points (44). Goalie Antti Raanta has posted two shutouts in three of his last starts.